When travellers rave about Banff backcountry trail rides, they often mention the beautiful scenery, the relaxing lodge and the hearty food. However, what really makes the horseback trip memorable is the interaction with the horses. Michelle from Ontario loved the “playful personality” of her horse, Posse, as well as the “easy, calm and cool” nature of her son’s ride, Silk. Daniel from Toronto writes about how “comfortable” he felt with his horse, Spencer. 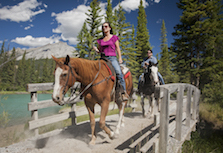 This is what makes a horseback riding trip really special – the opportunity to interact with these beautiful and intelligent beasts while exploring the spectacular Banff backcountry. The funny quirks of the horses’ personalities bring laughter around the campfire at the end of the day; the quiet moments of understanding will leave you in awe at what remarkable creatures horses really are. Researchers at Tromsø University in Norway have conducted a study into the bond between people and horses, interviewing a wide range of riders from Norway and the Midwestern USA. They found several common themes throughout the interviews – one of the most intriguing concepts being the idea of “co-being.” Essentially, when horse and rider work together towards a common goal they become attuned to each other’s physical and mental needs and experience mutual benefits. This goes along with the Mirror Theory that a horse is a reflection of its rider – but it explains the relationship in a much more complex way. A horse is not just a passive reflection of the rider, subject to the rider’s whims. Instead, the horse and human relationship can be quite egalitarian and the rider learns to adapt to and accommodate for his or her horse as much as the horse learns to obey commands. It’s a synergistic balance that can be nurtured and deepened with time. Nancy from Writing Horseback has experienced this powerful bond between horse and rider firsthand. She told me a story of a very special horse who remembered her, even after 15 years. There are countless other heartwarming stories of horses remembering their riders, even after many years. Scientists believe that horses are able to distinguish humans by their voices. Researchers at the University of Sussex performed a study where they broadcast the voices of horse’s owners over loudspeakers, with both the owner and a stranger standing near the horse. When the horse heard the voice of the owner over the loudspeaker, it would turn to the owner rather than the stranger. Recognizing voices in this way was previously thought to only be a human trait. Horses don’t speak our language, but we can still communicate with them in a lot of effective ways. Nancy also told me about a connection she forged with Magnum, a Tennessee Walking Horse she rode in Montana. They were able to understand each other, even though no words were spoken. Horses are quite intelligent creatures and they can pick up on a lot of the non-verbal cues that humans give, allowing them to understand your mood and emotions. Your horse knows when you are nervous and when you are calm. He knows when you are feeling sad or when you are happy or confident. And of course… he always knows when you have carrots. Joe from the Soul of a Horse blog writes about this powerful bond and the gentle kindness that is necessary when communicating with horses. In his story “Trust – It Changes Everything” he writes about training his horse Ezekiel. After many attempts to teach Ezekiel the command “back up” he describes the lightbulb moment when the horse finally understood. It is important to remember this. Unlike a bicycle or an ATV, your four-legged transport is a living and breathing creature with a mind and soul of its own. It learns and remembers. When you get out of the saddle at the end of the day the journey will have changed you both. As a rider, it is your responsibility to make sure that change is a positive one. Have you experienced a special connection with a horse? Let us know in the comments!